As a financial advisor, you help your clients understand that investing alone is not enough; they must also focus on managing risk (e.g., in the form of insurance). Well, that same, sound advice also applies to your business. Creating a strong password is one of the easiest ways you can kill two birds with one stone: safeguard your clients’ data and protect your livelihood. I know what you’re probably thinking: You can’t bear to come up with another password. I’m right there with you. (Here at Commonwealth, we actually change our passwords every 90 days.) And with all the passwords you use in your work and personal life, how can you meet this security challenge? In fact, a complex password need not be burdensome. Here are a few tips for creating a strong password that is easy to remember but hard to crack. 1) Use numbers and symbols in place of letters. Did you know that a four-letter password, even one using both uppercase and lowercase letters, can be hacked in less than two-and-a-half minutes? Even so, many Internet users tend to use the same password for multiple sites, and some people rarely change their passwords—meaning that in less than three minutes, a hacker could have access to e-mail accounts, bank accounts, social networking sites, and any of the other online subscriptions most of us have. Ask4James = Ask for James. I82cookies = I ate two cookies. Il2s4sits = I love to shop for sandals in the spring. Ig2wo3taw = I’m going to work out three times a week. LsIca30isb = Last summer I caught a 30-inch striped bass. You can also use a single mnemonic theme to build and remember multiple passwords. If you use your birthday password “MbiJ20th” (My birthday is June 20th”) for banking, then your e-mail password could be based on “My brother’s birthday is October 5th” ("MbbiO5th"). 5) Follow keyboard patterns. What happens when you form the letter V on the keyboard? “1qazse44” (look at your fingers when you type it). Another example is “!QAZSE$$”—this is the same V formation while holding the shift key. As you can imagine, there are numerous patterns on the keyboard that you can use to develop complex passwords. Besides creating a strong password, there are other best practices for keeping your sensitive information safe. Security questions. Many sites offer the same or similar security questions (e.g., “What’s your mother’s maiden name?”). Unfortunately, the average identity thief can get the answers to these common questions simply by perusing your social media sites. Aside from limiting how much personal information you share online, a surefire way to keep criminals from determining the answers to your security questions is to make up your responses. 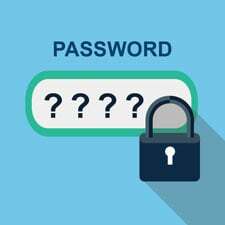 The key here is to actually remember those made-up answers—and that’s where a password management program comes into play. Password management. There are many password managers available, including LastPass and Dashlane. They provide one convenient location to manage your passwords and keep them out of the hands of hackers. Plus, they offer the convenience of remembering only one master password, which is almost a necessity when you consider all of the usernames and passwords you’re probably using today. It’s not always simple to come up with complex passwords, but it’s important to remember that passwords that are easy to create and remember are often the easiest to hack. I hope the guidance offered here will help you come up with unique passwords that will be easy for you to remember and tough for potential identity thieves to crack. Do you use a password management program? Have you ever been hacked due to weak passwords? Please share your thoughts with us below.